Appealing apartment situated close to the Copenhagen Lakes, Copenhagen Food Market and Nørreport station. The apartment contains one bedrooms and has enough space for two adults. Great apartment on a just as great location. The street Kjeld Langes Gade will take you directly to the Copenhagen Lakes as well as Nansensgade, the side street off Frederiksborggade, which is the charming main street in the old part of Copenhagen. Frederiksborggade will take you directly to Nørreport Station, which serves as one of the main hubs for public transportation in Copenhagen. The area is quite lively and you will find everything you need within 500 metres. The cosy side streets offer a large selection of cafés and restaurants and the shopping opportunities are excellent, as you can follow Frederiksborggade to the pedestrian shopping streets around Strøget. 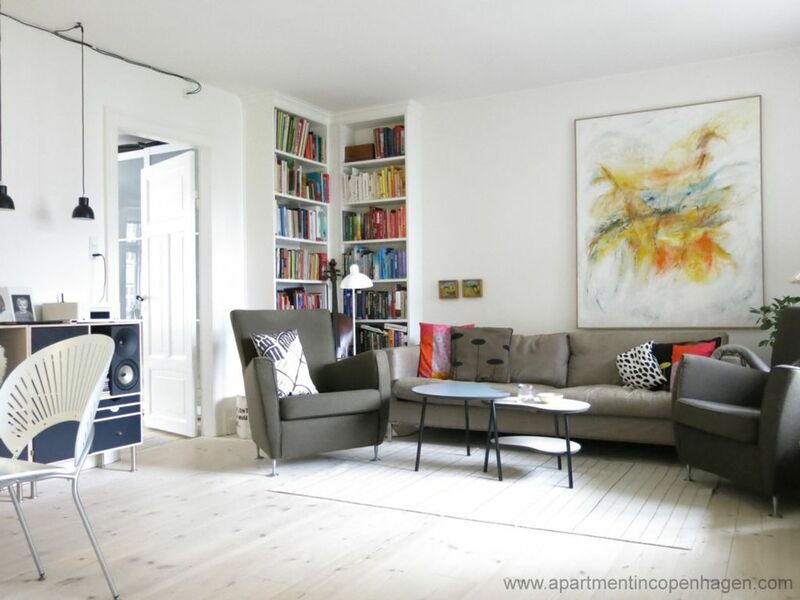 Spacious 90m2 apartment located very close to the Copenhagen Lakes and Nørreport Station. Hall, sitting room with a large corner balcony offering a view across the building's green yard, 1 bedroom, combined toilet and bathroom, and kitchen with a small dining table. Wi-Fi, TV with international channels, stereo, dishwasher and washing machine. This is a lovely, well-maintained apartment in a relatively quiet part of central Copenhagen, about 5 blocks from the metro. Filled with light, lovely Scandinavian furniture and art and intriguing family photos. It is right off Nansensgade, which abounds with cafes and restaurants. We were in Copenhagen to visit friends (we used to live in the city) and really felt at home. I love that the owner invites guests to check on the plants and add water. As a gardener, I appreciated the trust! We would definitely stay here again. Good location. Close walk to 2 different Metro Station. Little Cafes right on the street around the corner and supermarket and food hall market also close. The place is very spacious and loved the balcony in the back looking at the enclosed community garden/playground. This was the first time check out time was 10:00am, I think they would have accommodated a later time, but I was too happy and busy to take the time to ask. Definitely a good stay! Perfect location. Very spacious and comfortable apartment.